The Imperial War Museum has recently uploaded some images of FA 24 (privously FFA 54). Does anyone know what home regiments or medals are on display? As per the IWM terms, images can be posted here provided that it is for educational (or non-profit) purposes. The top one appears to be Hans-Achim v. Grone from Husaren-Regiment Nr. 17. Hans-Achim Friedrich Emil Dietrich, *19.8.1890 in Ballenstedt am Harz, †25.12.1960 in Wiesbaden. He received the Braunschweig Kriegsverdienstkreuz (2nd on the medal bar) as an HR 17 officer and the Anhalt Friedrichkreuz (4th on the medal bar) as a native of the duchy. The Oldenburg Friedrich-August-Kreuz is between them on the bar. I'm not sure about an Oldenburg connection, but the other officer has the Friedrich-August-Kreuz 1.Klasse, so maybe the Fliegerabteilung received some Oldenburg awards. Great detective work! Thanks for the info on the awards he is wearing. Okay, here is another one. I can't read the device on the shoulder boards. He has the Prussian and Austro-Hungarian pilot's badges, as well as the ribbon for the Austro-Hungarian Military Merit Cross 3rd Class with War Decoration. Below the Iron Cross ribbon is a Sachsen-Meiningen ribbon, either the Cross for Merit in War or the Medal for Merit in War, if awarded before he was commissioned. Thanks for your reply. Apparently there were only 685 awards of the Cross for Merit in War (IF it is this medal), so there might be a chance of identifying him provided that the medal rolls also list aviation recipients. Do you know what medals are being displayed on the second photo? There was also a Lt.d.R. 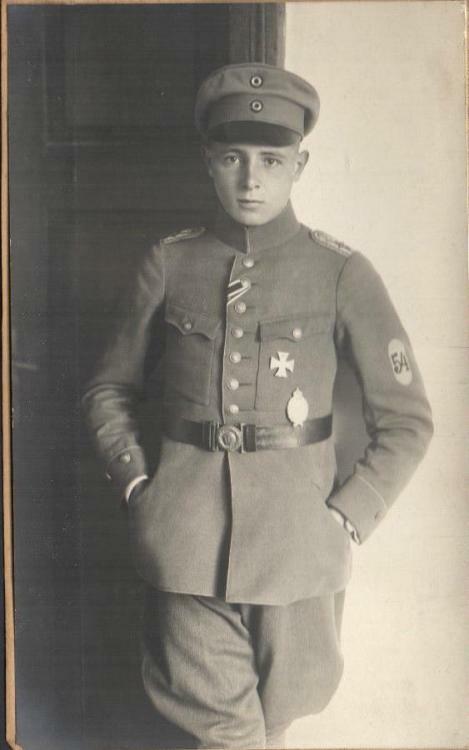 Willi Ott in FFA 54 who had both the Sachsen-Meiningen and Austro-Hungarian awards (SMK and ÖM3K), but his parent regiment was IR 32. That certainly is not a "32" on the shoulder straps. It looks like it might be the cursive "T" of one of the telegraph battalions. Regarding the second photo, it looks like a "31" on his shoulder boards. It might be Günther v. Landwüst, later an Oberst in the Luftwaffe. He was born in Oldenburg, the capital of the grand duchy, which would account for the Friedrich-August-Kreuz 1.Klasse between his EK1 and pilot's badge. His ribbon bar appears to be (1) EK2 (2) ?? (3) OK2 (4) ÖM3K. The second ribbon might be the Hamburg Hanseatenkreuz; the Altona-based IR 31 would have had many Hamburg citizens in its ranks, and many officers in the regiment received the Hanseatenkreuz. Landwüst received the Bavarian Military Merit Order in April 1918, so if it is him, the picture would date to before then. Dave Danner wrote : I'm not sure about an Oldenburg connection, but the other officer has the Friedrich-August-Kreuz 1.Klasse, so maybe the Fliegerabteilung received some Oldenburg awards. FFA 54/FA 24 was part of Süd Army from start 1915 until late 1917. Maybe some Oldenburg Regimenten served within this Army ? Gustav Meyer became Meyer-Spelbrink in mid 1920s and still hold that name during WW2, maybe changed his name a second time to Meyer zu Spelbrink after WW2..
Langhoff might be Oblt Georg Langhoff from IR 42 but I dont have him within this unit. Oblt Hans Bergling was from IR 168. Eicke might be the Württemberger Lt or Lt dR Hans Eick from IR 127 who was captured in the autumn of 1916. Franz Schleiff, the later Ace came from FAR 73, also PlM candidate. I have Oblt Herbert Sonnenburg from FAR 46 at AFP Süd and stab Kofl Süd but not within FFA 54, maybe a visitor ? Very interesting about Willi Ott, which is a new name for me. I hadn’t noticed the ’31’ on his shoulder strap! So von Landwüst is a good candidate. Does the abbreviation OK2 mean Friedrich-August Cross 2nd Class? Thanks for the first names. The link to FFA 54 is tenuous for some of these people. 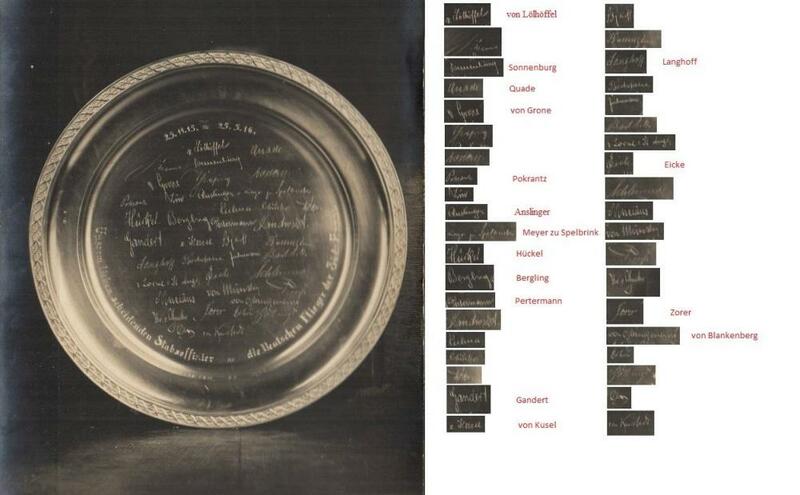 I saw a photo of a silver plate which had signatures inscribed – I will post this photo later. Ok here is a nice photo of Hptm Erich Quade – does anyone know what award he is wearing through the button-hole along with the EK2? Quade was originally from IR 168, a Grand Ducal Hessian regiment. 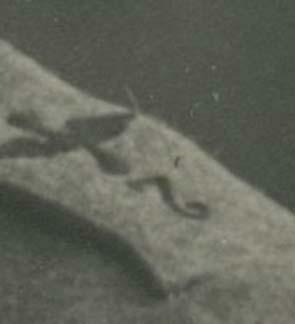 The buttonhole ribbon is the General Honor Decoration "For Bravery" (Allgemeines Ehrenzeichen "Für Tapferkeit"), typically abbreviated HT, based on the Reichswehr rank lists. You also sometimes see HAE1 or HAE.T for this medal and HAE2 or HAE.KV for the General Honor Decoration "For War Merit". 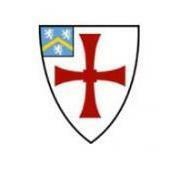 OK2 is indeed the Friedrich August Cross 2nd Class (Friedrich-August-Kreuz 2. Klasse). You also sometimes see OFAK2 or OFA2. Thanks a lot, I'll consider this in future. I guess he'll remain a mystery for now. Thanks for the note about Quade's award, and the additional names. Ok here is the photo of the silver plate. I think I can also see the names Zorer and von Kusel in there. Sorry but this is the best resolution I have. Very interesting plate Matt ! It might have been a gift to the Stofl Süd, Hptm Wilberg for his service in that position as period fits. He later became an General. Unfortunate i cannot make the picture bigger so can you cut out all the rest of the names as you have done with those identified ? You mean like this? I have added the name Pokrantz (I know this man served with this unit, and the signature seems to fit. Also the name next to Pertermann could be von Landwüst? When looking further on that plate I am "now" convinced it have officers from both FFA 54 and AFA/FAA 220. When Wilberg left the command of Stofl Süd late May 1916 to take command of Stofl Mackensen the "Army" only had two flying units. When AFA 220 was formed early 1916 it had four a/c and six officers. From the original officers I have five names but one was captured in April 1916. 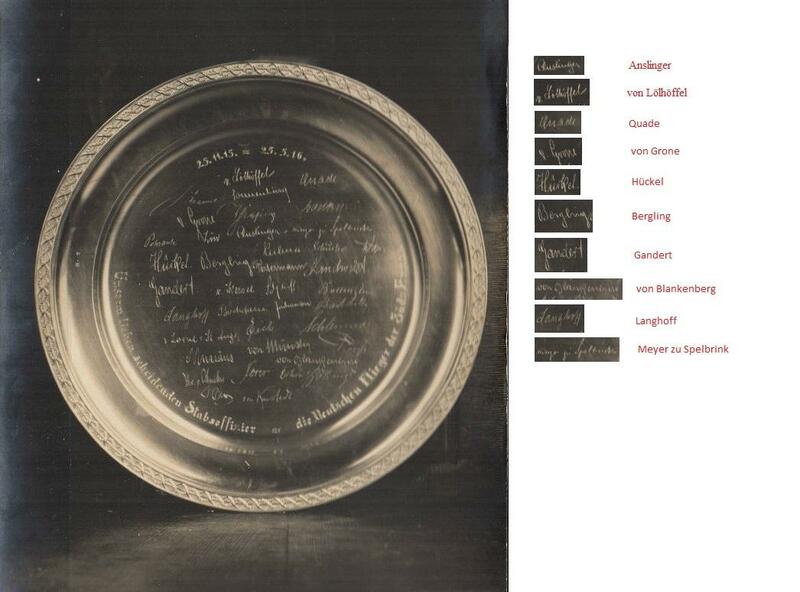 The four others officers from AFA 220 are all apparently on that plate, Hptm Walter Braune, Lt Wilhelm von Münster, Lt dR Alfred Preiß and Lt dR Emil Schlemmer. right side: number 21 = probably Schleiff, number 27 = Lt Oskar von Lorne von St. Ange, number 28 = Hans Eick is also the name of his file in Stuttgart, number 29 = Schlemmer, number 30 = Lt Walter Mussäus, number 31 = von Münster, number 32 = Preiß, number 35 = von Blankenburg, number 36 = Dahm, number 40 = Wilhelm von Karstedt. Some of the others should be able to solve but maybe need better close up for some. As you see a mix of flyers from FFA 54, AFA 220, Stofl Süd and AFP Süd. And thanks for providing all these photos of high quality ! I am not good reading signatures so you might need an reading "expert" for the last unsolved names. However I have rather good unit rosters for the units involved, but not complete. Here are some more "guesses", number 7 might be Rittm Voelkel who was a long timer within FFA 54, number 25 is probably Lt dR Fritz Imhausen, number 33 might be Lt Bodo Frhr von Lyncker and number 39 might be Ott. Maybe someone else could solve the last signatures ? EK2, Bavarian Military Merit Order/Cross (depending on if awarded before or after commissioning as a Leutnant), Austro-Hungarian Military Merit Cross, Turkish something with sabers (probably a Liakat), Turkish War Medal (also worn as a pinback below). The last decoration was officially named the "War Medal" (Harp Madalyası). Commonwealth and other English-language sources often call it the Gallipoli Star, but was not directly connected to the Gallipoli campaign - it was just the Ottoman EK equivalent. German sources often called it the Iron Halfmoon/Iron Crescent (Eiserner Halbmond). The Liakat or Merit Medal was generally the next medal up in the Ottoman awards hierarchy. I notice that there is an Austrian officer present in the second from back row (and, perhaps, another in the rear row). I wonder what they are doing there? may any of the Germans have A-H aviation badges. I often wonder how many A-H aviators were awarded and wore German Aviation badges. all the photos posted are superb quality for the study of uniforms, insignia, and medals. Dave Danner always amazes me with his vast knowledge and resource material. With regards to the last photo, I believe that Leopold Anslinger in in the centre of the front row (with 54 on his sleeve). 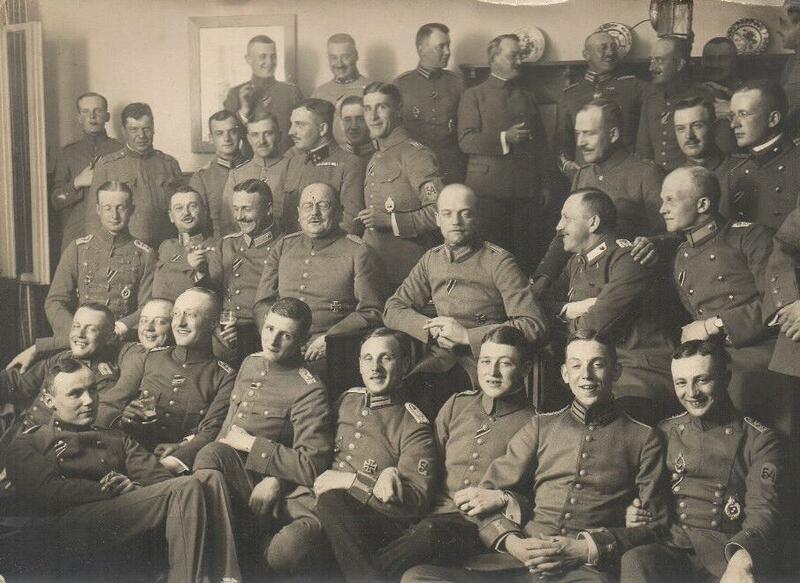 In the second row is von Grone on the extreme left, Hptm Lölhöffel von Löwensprung is 5th from left facing the camera, next to him (6th from left) is Hptm Erich Quade. It looks like he may have red piped shoulder boards. What regiment did he originate?